Â **As of 2019, if it has been more than a year since you purchased Cue Chronicle and new versions have been made available, there will be a charge to register a new device. Download CueChronicle FS or RT and Install it on your Computer. Â Â Â Â Â Â FS Â Users Open CCStartTemplate v4.fmp12, file path shown below. Â Â Â Â Â Â RT Users Open CCStartTemplate v4.fmp12, file path shown below. 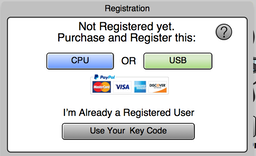 Click the Register/Buy Now button ( or use the Registration menu). 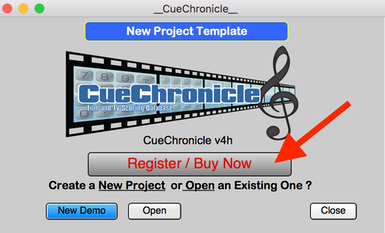 If you are already a CC v3 registered user, click the Upgrade to v4 button. If you are a new user click the Full Purchase button.